If I had to pick a favorite body part of my dogs, paws would definitely make the top 3. I just love them. They’re furry and massive. They’re strong and soft. And they’re more complex than people realize. A dog’s paw consists of 5 marvelous parts. 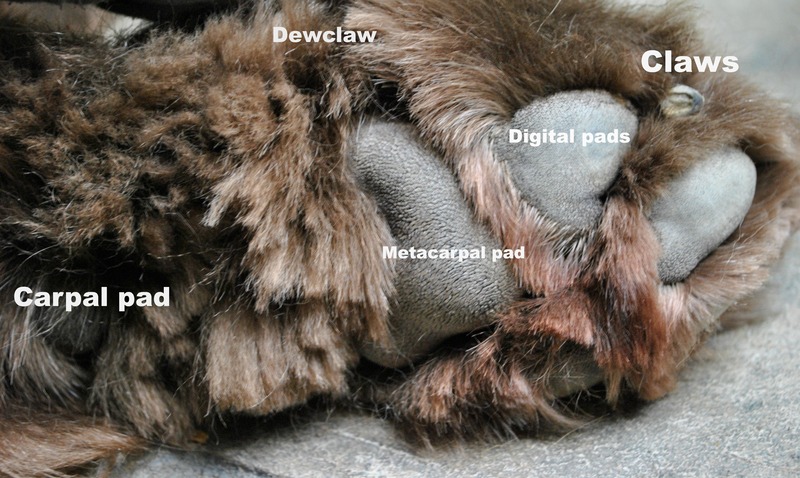 The claws, digital pads, metacarpal pad, carpal pad and the dewclaw. The digital pads and metacarpal pad help to protect the joints and bone of the paw by acting as shock absorbers. The claws help to create traction and help a dog dig and tear. The carpal pad helps the dog navigate treacherous terrain, such as steep or slippery slopes. They act as brakes for the paw. Dewclaws are thought to be the equivalent to human thumbs and can help dogs get a better grip on things. Some dogs, such as the Great Pyrenees, have rear dewclaws which serve a purpose to help stabilize them as they move around on rough terrain. Each pad is made up of fatty tissue. This fatty tissue provides insulation and protects the paw from rough surfaces and cold surfaces. Some dogs have thicker paw pads than other dogs based on the climate where they live and working status. Most Newfoundland dogs will have thicker pads versus other breeds because they tend to be out in colder temperatures than others. The inner layer of skin on their paws have sweat glands. These sweat glands move perspiration to the outer layer of the skin keeping the dog cool. Paws can also sweat when a dog is nervous. These means that unlike humans, dog’s digits will take on most of their weight when they walk, not their heels. This is why it’s so important to practice good paw care! 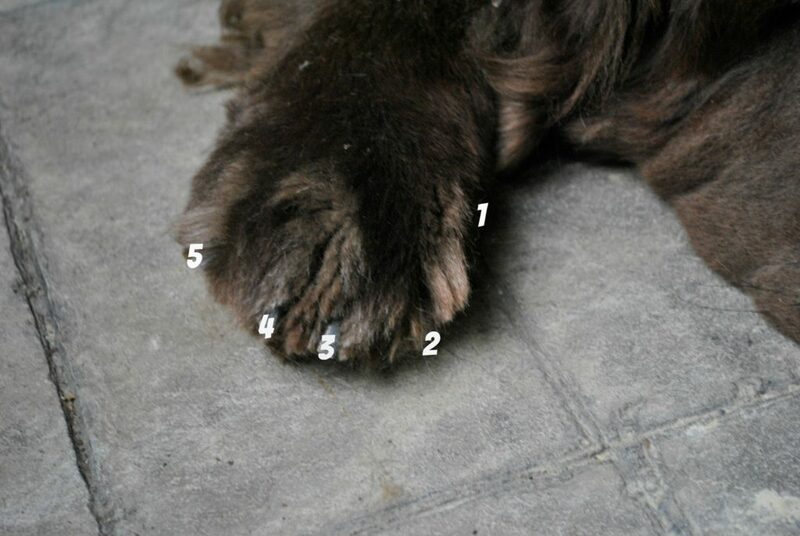 Most dogs have 5 digits, digit 1 is the dewclaw, digit 2 is the index toe and so on. Newfoundland dogs have the longest toes of any breed followed closely by the Labrador Retriever! Not only do dog paws come in different sizes, they also come in different shapes, cat feet, webbed feet, and hare feet. Each serves a purpose to the dog. Cat feet are more compact, this uses less energy to lift and increase endurance. 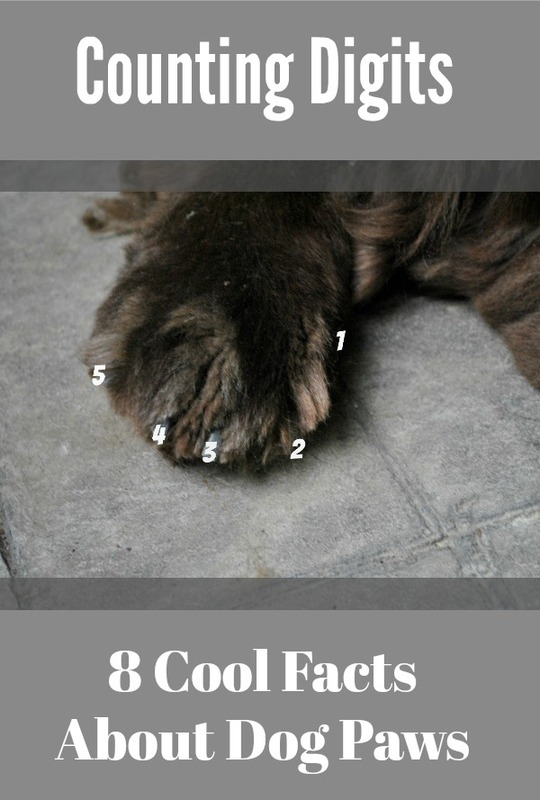 The Newfoundland, Doberman, Akita, Kuvasz and Old English Sheepdog are some of the breeds that have cat feet. Hare feet are more long and slender than cat feet. The two middle digits are longer than the outer toes. Some breeds that have hare paws are the Greyhound, Borzoi, Samoyed and Skye Terrier. Webbed Feet are just that, they are webbed. Technically all dogs have webbed paws but some dogs have more tissue that connects the toes than others. This webbing allows dogs to swim faster and more efficiently. A few dog breeds that have webbed paws are Newfoundlands, Labrador Retrievers, Chesapeake Bay Retrievers, Portuguese Water Dog, and Standard Poodles. If your dog can stand to have their paws touched then a paw massage is a great idea! Massaging the paw is said to relax a dog and increase circulation. Just think about how good it feels when you get a foot massage! Leroy loves a good paw massage but Sherman is not a fan. 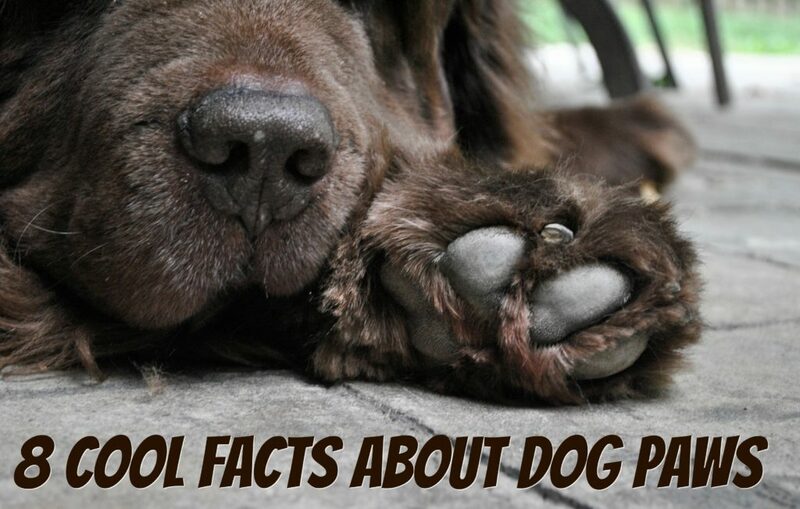 Most dog paws have a distinct smell. We often refer to this as “frito feet” or “popcorn feet”. The smell is actually due to bacteria on their paws that they pick up when walking. This bacteria mixed with sweaty paws gives off a yeasty smell similar to corn chips! Overly stinky paws and paws that are red and irritated are not normal and can mean that an infection is present so it’s best to have those checked out by your veterinarian! So what do you think? How cool are your dog’s paws now? Looking to protect your dog’s pads from harsh conditions? Check out our Homemade Paw Balm. Oh no. I hope your feet feel better soon. Allergies stink! I actually have to make another batch and would gladly send you some! Paws are super impawtant! We love paw massages around here and get them often. Mom always says we have to take extra good care of our paws so we can keep walking and running. That’s great! Leroy loves a good paw massage but Sherman is not a fan! If I had a basset I don’t think that I could keep my hands off of the ears! Our paws are very sensitive, but over the years Mom has learned to get us to trust her touching them. That’s great! It can take a lot of work and patience to get use to have those paws touched! Sam’s webbed feet are totally wasted. That dog wouldn’t go into water with a gun to his head. That said, I think webbed feet are pawsitively cool. Oh heck who am I kidding…ALL dog feet are some kind of miracle for all that they are able to do. Happy weekend. Ha! Leroy only uses his webbed toes to navigate through mud! Lol! I did a post on this once too, inspired by Luke’s freakishly long toes! He’s a Lab mix so I guess that makes sense then. I love his paws, but he does not like having them handled, which drives me crazy because I want to play with his toes – LOL. Sherman doesn’t like any part of his legs or paws touched either! Very cool information! I play with Barley’s toes all the time–she doesn’t love it, but she humors me 🙂 She’s just lucky her feet aren’t as massive as your boys’ feet or I’d never leave them alone! I think Leroy’s the same way, he doesn’t make much of a fuss when I’m playing with his tootsies! I love my Newfs paws. I have massaged Mica’s legs and paws for years to hopefully keep them healthy as she gets older. Mica loves a massage anywhere. Aspen has adorable paws, he still has a couple pink pads that I love. He will let me touch them and look to see if they are OK quickly, but I have to show him I have nothing in my hands ( like clippers). I’m jealous that Aspen has pick pads! I wouldn’t be able to keep my hands off of them!